Dubrovnik Old Town is the reason why most tourists visit Dubrovnik. This is the old part of Dubrovnik located within the city walls. It's very easy to walk around it and you can get from one gate to another in several minutes. When you enter the Old Town you will find yourself on Stradun - the central street from where you can easily walk to each corner of the city. At the beginning of Stradun to the right, the Great Onofrio's Fountain is located and to the left Franciscan Monastery can be found. The Stradun, also called Placa, runs from Pile Gate to Ploce Gate. At other end of Stradun you will find the Bell Tower, Small Onofrio's Fountain, Sponza Palace, Orlando's Column and Church of St Blaise. Throughout the Old Town you will find numerous restaurants serving Mediterranean, Bosnian, Asian and other international food. Numerous souvenir shops offer a great choice of local products such as wines, olive oils, natural cosmetics etc. During your stay in Old Town you can visit numerous events that usually take place within city walls. For those who are into history great museums can be found throughout the city. The Cable car embarkation station is located close to the Old Town. Within city walls you can find numerous rooms, hostels and apartments ranging from basic to exclusive. Be aware that to reach some private accommodation you need to climb many stairs. 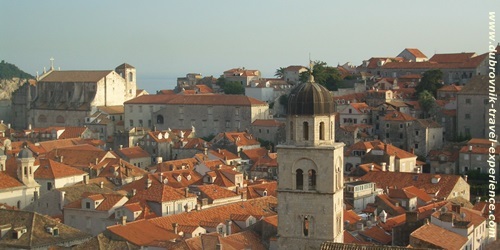 There are several hotels located within city walls of Dubrovnik. The Pucic Palace Hotel is located on Gundulic Square, in the very centre of Dubrovnik's Old Town. It is ideal starting point for exploring historical attractions of Dubrovnik. This is an exclusive hotel located in a renaissance palace and has only 17 rooms and 2 suites. Hotel Stari Grad is a recently renovated 4-star hotel located in a quiet street close to Stradun. This 4-star hotel is perfect for guests seeking for cosy and familiar atmosphere. Hotel offers 8 comfortable rooms. At the top of the hotel there is a terrace where you can enjoy views over the historic Dubrovnik. Dubrovnik Old Town can be reached by city bus from any other Dubrovnik neighbourhood. FROM GRUZ PORT: Take any bus from port area (No.1, No.1A, No.1B, No.3) and travel until the last stop - Pile Gate. FROM BABIN KUK: Take bus no.6 and travel until the last stop (Pile Gate). FROM LAPAD: Take bus no.4 to Pile Gate.